These unique masks are carved from wood. Some artists, like Gene Thomas, use white pine to carve their masks, while others use basswood. The masks have real horse tail hair and eyes made of tin. Smaller than the traditional False Face masks, these unique False Face Guardian Masks are hand-carved from wood with deerhide leather ties for the hair and a loop for hanging at the top. The mask alone measure about 3" long and are 2" to 2.5" wide. They weigh approximately 25 grams. They may or may not come signed by the artist. The picture above is for reference only. You will get a similar mask to those above, but if you would like a specific one, please let us know. Our Gxx codes denote individual pieces. 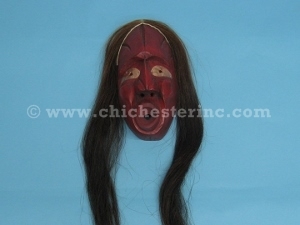 If you would like to order a specific false face mask, please go to our Gallery to pick the exact one shown. Note that our selection keeps changing. If you want to be on our notification list, please let us know. When we get a new selection of masks, we will send you an e-mail. We also have a book, "The False Faces of the Iroquois (Civilization of the American Indian)," available for those seeking to know more about this art. Genus and species of Horse: Equus caballus. Ranch Raised. Deer are not endangered but they are subject to USFWS control. A permit is required for all shipments outside the U.S. Horse is not subject to CITES or USFWS controls. Click on the underlined names above for further biographical information. 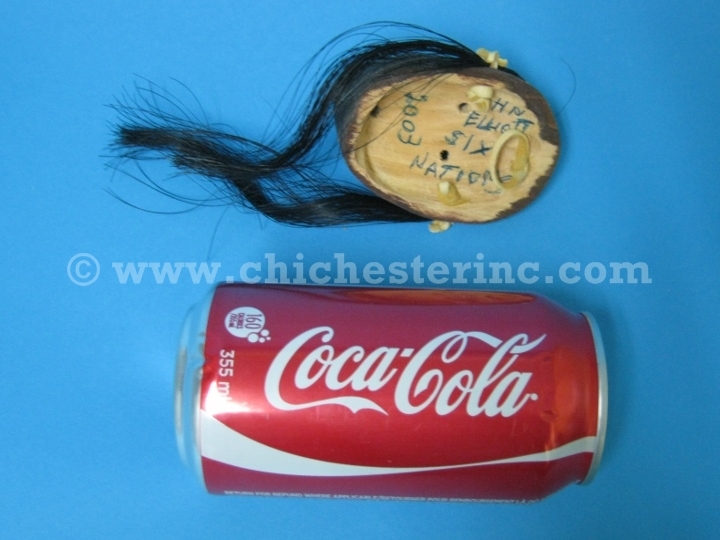 Many Iroquois False Face Masks are not signed, but have numbers stamped into the side under the hair to confirm that the masks are registered on Six Nations in Ontario, Canada as authentic Iroquois False Face Masks. As part of the registration process, the Iroquois name of the artist is recorded in a registry, but not the English name. For example, one artist works under the Iroquois name of Hoda’nyeken which translates into English as "Stick on the Shoulder." As members of the Indian Arts and Crafts Association, we support aggressive legislation designed to prohibit non-Native merchandise being sold as though it were Native-made. 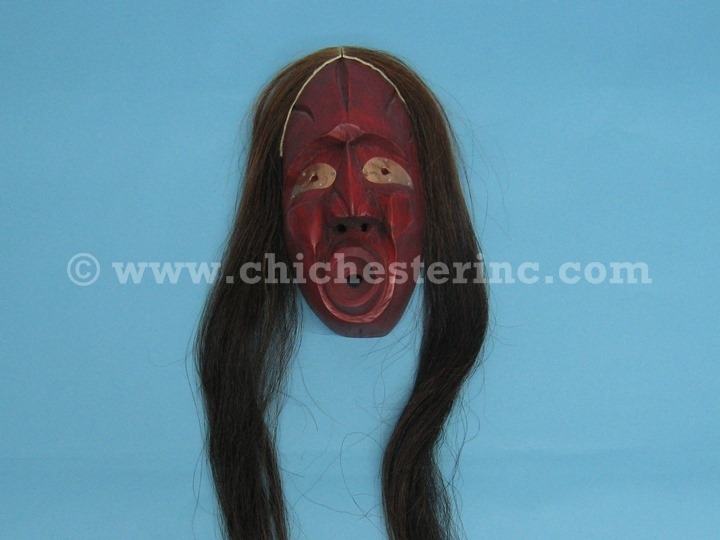 In the course of our business, we come across situations where collectors are selling off masks accumulated over many years or individuals who have inherited masks and the original owner has died and is not available for consultation as to the exact circumstances regarding the initial purchase of the mask. 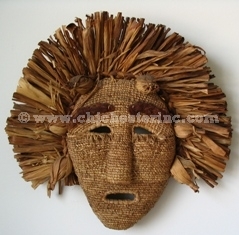 Unsigned masks are offered only if we have complete confidence as to the authenticity of the mask as a Native-made item based on the reputation of the collector and our expert knowledge of these masks. We will not offer for sale any masks where we have any doubt whatsoever as to their authenticity. Some members of the Iroquois Nation are very sensitive about the sale of False Face Masks or their display in museums. The primary concern is over the sale or display of masks that have been used in religious ceremonies and are considered to be "live." 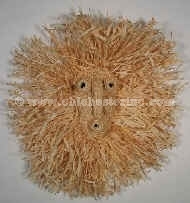 The masks we offer for sale have not been blessed and are not considered to be live masks. 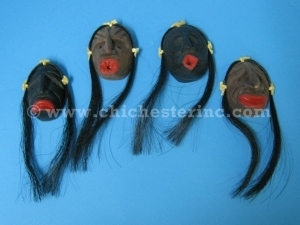 The artists who make these masks do not consider their sale or distribution into non-Iroquois society to be an issue. They often earn their livelihood or supplement their income by making the masks and see it as a way of promoting Iroquois culture. Every now and then, we receive e-mails from individuals who want us to stop offering the masks. We explain our position and have offered them an opportunity to post a message on our website provided they give us permission in writing to reproduce the information so as to avoid any possibility of copyright violation. To date, nobody has responded. I am responding to your letter of October 3, 1994 requesting clarification of masks being sold to galleries, collectors, and other institutions. First of all in the past the people carved different forms of art to help support their livelihood. Particularly today as there are no jobs this maybe the only source for the people to make a living is to sell their art. Therefore many people do carve and sell their art. I believe that this is an honest thing to do rather than living on welfare or having to steal to provide for one's family. The masks that I carve are not "blessed" nor given any power for healing, and there is nothing wrong to sell these masks. On the other hand, I do agree when the people say that sacred masks should not be sold. Sacred masks are blessed and given power to heal and to cure. This is not a religious practice but it is a tradition that has been passed on from generation to generation. People are very critical but they overlook the practice to sell native medicine, to compete in native dances, and to sell their culture by smudging and by selling lacrosse sticks (it's medicine too). Today lacrosse sticks are sold and played all over the world. If masks are forbidden to be sold and it becomes too sacred then it will become a secret and no one will be able to carve a mask and know what it means and it will become lost among our people. This is the way I make my living I carve many forms of art and I make an honest living. If there is anyone out there who needs more information they can contact personally. I hope this clears confusion. On July 10, 2012, we received a call from Lana Watt, the Tribal Historic Preservation Officer from the Seneca Nation of Indians, claiming that she has the right to re-patriate any masks from federal institutions or any entity that receives federal funding or has federally guaranteed bank loans (Small Business Administration?). They do not appear to be making any distinction beween blessed religious objects from the longhouse and commercially produced art objects made by Iroquois artists.